Our Mission It is our Mission is to proactively influence public policy and practice on issues which impact economy, trade, commerce and industry and also social processes such as education and health, infrastructure and environment. Reliability, timeliness, innovation and work ethic of a high order is our offer to support and serve our Members. The Beginnings “….Watch over and protect the interests of trade; receive and collect information on all matters of mercantile interest bearing upon the removal of grievances and promotion of the common good;… receive references on matters of custom or usage in doubt or dispute, decide on the same and record the decisions made for further reference; and to form by that and other code of practices whereby the transaction of business by all companies engaged in it are simplified and facilitated”. The History From that day in September 1836, our history has been closely linked to the social, economic and political life and times of the State. Our evolution and growth can be seen in district phases: •	The first six decades until 1900 were the period of substantial achievements in facilitating infrastructure. 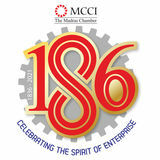 Phrased in this laboured style were the objectives of the Madras Chamber of Commerce founded on September 29, 1836. Eighteen founding members with John Alves Arbuthnot as the Chairman made up the first Committee of the Chamber. This was just a week after the Bombay Chamber of Commerce was born. •	The next fifty years saw initially, political reforms and our reactions to these. This was followed by a time of transition in the political scene from a colonial administration to the constitutional set up of free India. The period also witnessed the formation of the Federal Organization, the Associated Chambers of Commerce comprising the Bengal, Bombay, Madras and other Chambers. Our approach and strategy also changed in accordance with the new political ambience. •	1950-1986 was the period of industrial growth and commercial expansion for Madras. 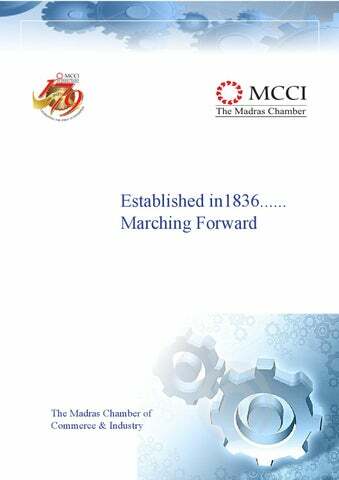 Significantly, we change our name to The Madras Chamber of Commerce & Industry in 1966 – reflecting the new challenges and demands being made on us and the enlarged role we saw for ourselves. •	Since 1986, and more particularly after 1991, in the liberalized environment, we have strived to forcefully and unsparingly articulate the collective interests of enterprise. Today we endeavour to proactively influence public policy and practice on issues which impact economy, trade, commerce and industry. We see our role as also representing social processes such as education, health, infrastructure and environment. •	As the Chamber entered into its 175th year during 2011, it re pledged its commitment to stay agile and meet the dynamic requirements of the trade and industry. Few unique initiatives such as the Skill Development Centre and the Sustainable Chennai Forum mark our vision to ensure Sustainable Development, the theme chosen for the current decade. This is headed by the Secretary General who is the Chief Executive, ably assisted by Executives and other Staff. The Secretariat functions under the guidance of the General Committee. •	To help formulate policy decisions for creating a healthy environment for the growth of trade and industry in Tamil Nadu. •	To assist trade and industry in becoming competitive in national and international markets. •	To provide a forum to its members for interaction with Government, international agencies and intellectuals on issues of interest to industry. Our Organizational Structure General Committee The affairs of the Chamber are managed by a General Committee comprising President, Vice-President and eight other elected members. The term of the Committee and office bearers is one year. The General Committee also comprises co-opted members from academic and other institutions. The Committee meets at regular intervals. The Committee through the President and Vice-President, interacts closely with the Governments, both at the State and Centre, Financial institutions, the Planning Commission, RBI and other bodies on all matters of interest to industry and trade. The Chamber makes well reasoned out oral as well as written representations based on inputs received from member companies. Both at the State and Central level, the views and suggestions of the Chamber are well received and considered. Expert Committees The General Committee is ably assisted by the Expert Committees which are constituted each year at the Annual General Meeting. They consist of senior managers and functional experts dealing with respective subjects in their companies. Through the Expert Committees, the Chamber has access to collective expertise and knowledge on various subjects. Our Services Information Dissemination •	Dissemination of information to members on an on-going basis on changes in policies and legislations impacting businesses, market opportunities, emerging technologies and other relevant matters. •	Commissioning studies on subjects of importance which affect the trade & industry whenever necessary. •	Inter-connecting members and providing expert advice through interactive webpage. •	Arranging periodical dialogues on Policies and Procedures updates. Liaising & Lobbying •	Acting as a responsible voice of the member companies to represent to Government, both at the State and the Centre, escalating the grievances and issues of member companies. •	Arranging meetings with Government officials and liaising and lobbying with State and Central Government and their agencies for appropriate policies. •	Acting as a think-tank through the various Expert Committees of the Chamber and assisting the Government in the formulation of policies concerning industry and commerce and submitting Pre and Post-Budget memoranda to the State and the Central Government voicing the expectations and demands from the member companies. Networking Opportunity •	A huge opportunity is provided to network with the peer group through various meetings, workshops, round tables, and Interactions through inbound and outbound delegations. •	To Connect to other member Industries through our directory online/offline. Conducting trainings and workshops for capacity building of employees of member companies. Offering consultancies for clean practices and adoption of better technologies and improving business competencies. •	Providing skill development and vocational trainings. •	Indirect Taxes •	IT & ITes •	Legal Affairs •	Logistics •	Manufacturing •	VAT These Committees meet at periodic intervals and deliberate upon various current issues in their related areas and submit their recommendations for suitable redressals. Sustainable Chennai Forum (SCF) The SCF was launched on 9th November, 2011 on the occasion of the World Habitat Day celebrations with the aim of assisting and promoting a business case for sustainable development and evolving a congenial policy and action-oriented environment for the all round sustainable development of the Chennai Metropolitan Region. The Chamber is keen on being a leading advocate of sustainable development to make Chennai an inclusive, sustainable, clean and green metropolis. The Chamber’s SCF also networks with like-minded institutions and organizations in this sector towards fulfilling a common long-term goal. The SCF primarily focuses on areas like Energy, Water, Waste Management, Transport and Urban Greening. Apart from conducting numerous awareness and educative seminars on these subjects for different stake holders, we have now kick-started a few activities which includes undertaking studies and facilitating round tables/debates on the focus areas, creating a databank and library to facilitate regular dissemination of information related to sustainability, environmental audits and consultancies for industries in an attempt to assist them in making the shift towards eco-friendly business practices. Skill Development India now enjoys “demographic dividend” and any discourse on harnessing this acclaimed dividend puts the spotlight on the value and necessity of skill development. The Chamber was one of the first few organisations which realised the importance of skill development and launched a “War for Talent” project in 2004. In the 175th year, as a flagship activity, the Chamber continued its endeavour by embarking on an ambitious project to set up a centre for excellence in Vocational Training and Skill Development. The Chamber endeavours to translate the skill needs of industries into actions on the ground to build competencies. We are better positioned to do this because of our close working relations with member industries. Our long term goal is to create a Centre of Excellence for Skill Development to help industries as well as for achieving the socio–economic objectives of the nation. Future And what of our tomorrows? We are conscious that no institution – even one as venerable as the Chamber – can rest on its laurels. The challenges of the future are many and diverse. We believe the future is for those organizations that can chart outstanding roles for themselves – for those who can be proactive, imaginative and visionary. Only then can we become truly an informal but powerful influence as the “parliament of commerce” and enable trade and industry to code with the demands of the global market place. It is towards this goal that we aspire, ever conscious that “our position is in the present and our life is in the future”.